The virtual world, Second Life, is a digital realm where you can be anything or anybody you want. Your avatar (the digital representation of you) can interact with others, or just explore. There is also a thriving economy, where you can own land, build things or buy things, like clothes. 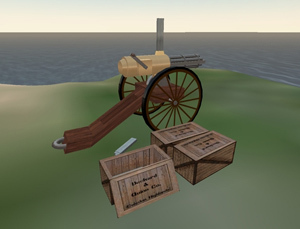 You can also buy things like Gatling guns to protect yourself and/or your land there. The Deckard & Quinn Co. build things for sale there, and this brass and steel Gatling gun is one of them. Brass and steel may be a misnomer as it is all ones and zeros. But possibly brass and steel ones and zeros. Only $560 Linden dollars or $2.69 USD.